Tonight the FooFighters will play live through their Facebook page at www.facebook.com/foofighters. The performance starts at 7pm PT / 10pm ET - or 2am UK time. Powered by LiveStream the FooFighters will perform at their Studio 606 headquarters in LA and the event will be streamed live onto the 'Livestream' tab of the FooFighters Facebook page. 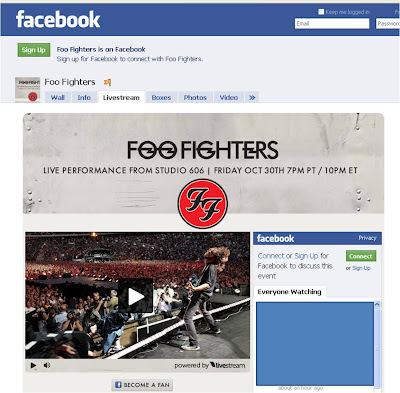 Their is also an RSVP Facebook event invite here and Facebook users will be able to update their status from inside the Foofighters stream and see comments from all viewers on the same page. This creates 'community' around the event, whilst also acting as viral promotion, encouraging more people to watch as they see friends updating statuses. On New Years Eve 2007 Radiohead performed their Scotch Mist concert and streamed it through YouTube and Current TV. In June 2008 RedBoxBlue performed the first live concert on Facebook and recently U2's Rose Bowl concert was streamed live on YouTube and attracted 10 million viewers. Official Facebook live events are becoming increasingly common too, first with Barack Obama's inauguration speech, then progressing to things like a live stream from the Bruno premiere - however, music performance seems to be the best fit for this type of activity and the FooFighters concert will continue to drive interest in real time streaming across social network sites. For those of you staying up - enjoy!